Continued research on sorghum could help cattle producers diversify their feedstuffs. GARDEN CITY, Kan. – As winter soon comes to a close, it is never too early to start planning feedstuffs production for cattle next winter. Forage sorghum offers a variety of benefits that help secure its place as one of those major feedstuffs. The growing interest is in part due to the versatility of forage sorghums, he said. 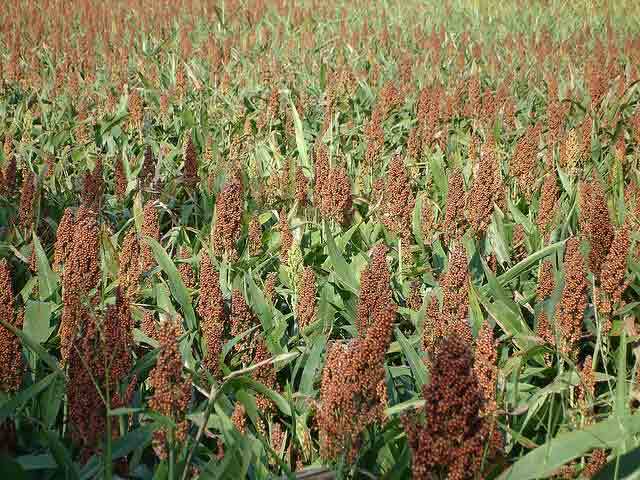 Other advantages of sorghum include that it uses less water than some other traditional forage crops and, when managed correctly, contains high-quality nutrients for cattle. Sorghum has better heat and drought tolerance than corn or alfalfa, and requires less irrigation than corn silage, Holman said. However, for producers who have adequate water, corn silage may suit their forage needs better than sorghum. Producers may view sorghum tonnage as the most important factor, he said, because they are paid on tons produced, like any biomass crop. But, feed quality is also important. Brown midrib, or BMR, forage sorghum has been around for many years, but it has become more common in the last 5 to 10 years, Holman said. “When you look at the midrib on the plant’s leaf, or if you cut open the stalk, it’s going to be brown in color versus white in color,” Holman said. BMR sorghum can be useful to producers when it comes to lignin content. Lignin helps provide the plant rigidity, but it also reduces fiber digestibility and thus energy content in forages. Photoperiod-sensitive (PPS) forage sorghum is another type of sorghum producers can consider utilizing. PPS forage sorghum does not produce seeds in Kansas, which extends the harvest window for hay production. But, PPS sorghum is not best for all types of production. Sorghum-Sudan grass has been on the market a while and can be used for grazing, he said. It is typically grown when a producer is looking for grazing potential or, more recently, as a good fit for a cover crop. Sorghum-Sudan grass varieties also fit a variety of difficult situations. “They tend to be a little more drought tolerant and more tolerant of high pH soils than forage sorghum,” Holman said. As with all crops, having a good nutrient management program is highly important. Over-applying nitrogen can be hazardous, which has been shown in work Holman and others at K-State have done the last several years that examined nitrogen response with these sorghum crops. K-State is adding a forage testing program for producers to aid them in their variety selection decision-making. For more information about forage sorghum, visit your local extension office. Several research publications about forage sorghum are available online through the K-State Research and Extension Bookstore.